"Gold mine" redirects here. For other uses, see Goldmine. The mining of the Hungarian deposit (present-day Slovakia) primarily around Kremnica was the largest of the Medieval period in Europe. During the 19th century, numerous gold rushes in remote regions around the globe caused large migrations of miners, such as the California Gold Rush of 1849, the Victorian Gold Rush, and the Klondike Gold Rush. The discovery of gold in the Witwatersrand led to the Second Boer War and ultimately the founding of South Africa. The Carlin Trend of Nevada, U.S., was discovered in 1961. Official estimates indicate that total world gold production since the beginning of civilization has been around 6,109,928,000 troy ounces (190,040.0 t) and total gold production in Nevada is 2.5% of that, ranking Nevada as one of the Earth's primary gold producing regions. Gold panning is the easiest and quickest technique for searching for gold, but is not commercially viable for extracting gold from large deposits, except where labor costs are very low or gold traces are substantial. Panning is often marketed as a tourist attraction on former gold fields. Before large production methods are used, a new source must be identified and panning is useful to identify placer gold deposits to be evaluated for commercial viability. Using a sluice box to extract gold from placer deposits has long been a very common practice in prospecting and small-scale mining. A sluice box is essentially a man made channel with riffles set in the bottom. The riffles are designed to create dead zones in the current to allow gold to drop out of suspension. The box is placed in the stream to channel water flow. Gold-bearing material is placed at the top of the box. The material is carried by the current through the volt where gold and other dense material settles out behind the riffles. Less dense material flows out of the box as tailings. Larger commercial placer mining operations employ screening plants, or trommels, to remove the larger alluvial materials such as boulders and gravel, before concentrating the remainder in a sluice box or jig plant. These operations typically include diesel powered, earth moving equipment, including excavators, bulldozers, wheel loaders, and rock trucks. Although this method has largely been replaced by modern methods, some dredging is done by small-scale miners using suction dredges. These are small machines that float on the water and are usually operated by one or two people. A suction dredge consists of a sluice box supported by pontoons, attached to a suction hose which is controlled by a miner working beneath the water. State dredging permits in many of the United States gold dredging areas specify a seasonal time period and area closures to avoid conflicts between dredgers and the spawning time of fish populations. Some states, such as Montana, require an extensive permitting procedure, including permits from the U.S. Corps of Engineers, the Montana Department of Environmental Quality, and the local county water quality boards. Some large suction dredges (100 horsepower (75 kW) & 250 mm (10 in)) are used in commercial production throughout the world. Small suction dredges are much more efficient at extracting smaller gold than the old bucket line. This has improved the chances of finding gold. Smaller dredges with 50-to-100-millimetre (2 to 4 in) suction tubes are used to sample areas behind boulders and along potential pay streaks, until "colour" (gold) appears. Other larger scale dredging operations take place on exposed river gravel bars at seasonal low water. These operations typically use a land based excavator to feed a gravel screening plant and sluice box floating in a temporary pond. The pond is excavated in the gravel bar and filled from the natural water table. "Pay" gravel is excavated from the front face of the pond and processed through the floating plant, with the gold trapped in the onboard sluice box and tailings stacked behind the plant, steadily filling in the back of the pond as the operation moves forward. This type of gold mining is characterized by its low cost, as each rock is moved only once. It also has low environmental impact, as no stripping of vegetation or overburden is necessary, and all process water is fully recycled. Such operations are typical on New Zealand's South Island and in the Klondike region of Canada. Also called a cradle, it uses riffles located in a high-walled box to trap gold in a similar manner to the sluice box. A rocker box uses less water than a sluice box and is well suited for areas where water is limited. A rocking motion provides the water movement needed for the gravity separation of gold in placer material. Hard rock gold mining extracts gold encased in rock, rather than fragments in loose sediment, and produces most of the world's gold. Sometimes open-pit mining is used, such as at the Fort Knox Mine in central Alaska. Barrick Gold Corporation has one of the largest open-pit gold mines in North America located on its Goldstrike mine property in north eastern Nevada. Other gold mines use underground mining, where the ore is extracted through tunnels or shafts. South Africa has the world's deepest hard rock gold mine up to 3,900 metres (12,800 ft) underground. At such depths, the heat is unbearable for humans, and air conditioning is required for the safety of the workers. 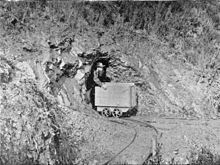 The first such mine to receive air conditioning was Robinson Deep, at that time the deepest mine in the world for any mineral. Gold is also produced by mining in which it is not the principal product. Large copper mines, such as the Bingham Canyon mine in Utah, often recover considerable amounts of gold and other metals along with copper. Some sand and gravel pits, such as those around Denver, Colorado, may recover small amounts of gold in their wash operations. The largest producing gold mine in the world, the Grasberg mine in Papua, Indonesia, is primarily a copper mine. A modest amount of precious metal is a by-product of sodium production. Cyanide extraction of gold may be used in areas where fine gold-bearing rocks are found. Sodium cyanide solution is mixed with finely ground rock that is proven to contain gold or silver, and is then separated from the ground rock as gold cyanide or silver cyanide solution. Zinc is added to precipitate out residual zinc as well as the silver and gold metals. The zinc is removed with sulfuric acid, leaving a silver or gold sludge that is generally smelted into an ingot then shipped to a metals refinery for final processing into 99.9999% pure metals. Advancements in the 1970s have seen activated carbon used in extracting gold from the leach solution. The gold is absorbed into the porous matrix of the carbon. Activated carbon has so much internal surface area, that fifteen grams of it has the equivalent surface area of the Melbourne Cricket Ground (18,100 square metres (195,000 sq ft)). The gold can be removed from the carbon by using a strong solution of caustic soda and cyanide, a process known as elution. Gold is then plated out onto steel wool through electrowinning. Gold specific resins can also be used in place of activated carbon, or where selective separation of gold from copper or other dissolved metals is required. The technique using dissolution with alkaline cyanide has been highly developed over recent years. It is particularly appropriate for low grade gold and silver ore processing (e.g. less than 5 ppm gold) but its use is not restricted to such ores. There are many environmental hazards associated with this extraction method, largely due to the high acute toxicity of the cyanide compounds involved. A major example of this hazard was demonstrated in the 2000 Baia Mare cyanide spill, when a break in holding pond dam at a mine waste reprocessing facility near Baia Mare in northern Romania released approximately 100,000 cubic metres (3,500,000 cu ft) of waste water contaminated with heavy metal sludge and up to 120 long tons (122 t) of cyanide into the Tisza River. As a consequence, most countries now have strict regulations for cyanide in plant discharges, and plants today include a specific cyanide-destruction step before discharging their tailings to a storage facility. Historically, mercury was used extensively in placer gold mining in order to form mercury-gold amalgam with smaller gold particles, and thereby increase the gold recovery rates. Large-scale use of mercury stopped in the 1960s. However, mercury is still used in artisanal and small-scale gold mining (ASGM), often clandestine, gold prospecting. It is estimated that 45,000 metric tons of mercury used in California for placer mining have not been recovered. While most of the gold is produced by major corporations, tens of thousands of people work independently in smaller, artisan operations, in some cases illegally. In Ghana, for instance, the galamseys are estimated to number 20,000 to 50,000. In neighboring francophone countries, such workers are called orpailleurs. In Brazil, such workers are called garimpeiros. In order to maximize gold extraction, mercury is often used to amalgamate with the metal. The gold is produced by boiling away the mercury from the amalgam. Mercury is effective in extracting very small gold particles, but the process is hazardous due to the toxicity of mercury vapour. Especially after the Minamata Convention has been ratified, there are initiatives to replace or reduce the use and emissions of mercury in the extraction of gold. Barrick Gold, Goldcorp, Newmont Mining Corporation, Newcrest Mining, and AngloGold Ashanti are the world's five largest gold mining companies by market capitalisation in 2008. Gold mining can significantly alter the natural environment. For example, gold mining activities in tropical forests are increasingly causing deforestation along rivers and in remote areas rich in biodiversity. Other gold mining impacts, particularly in aquatic systems with residual cyanide or mercury (used in the recovery of gold from ore), can be highly toxic to people and wildlife even at relatively low concentrations. However, there are clear moves by many in the non-governmental organization community to encourage more environmentally friendly and sustainable business practices in the mining industry. The primary way this is being achieved is via the promotion of so-called 'clean' or 'ethical' gold. The aim is to get all end users/retailers of gold to adhere to set of principles that encourage sustainable mining. Campaigns such as 'No Dirty Gold' are driving the message that the mining industry is harmful (for the reasons noted above), and so must be cleaned up. Also, NGOs are urging the industry and consumers to buy sustainably produced gold. Human Rights Watch produced a report that outlines some of challenges faced globally, noting that: "Thousands of children in the Philippines risk their lives every day mining gold. Children work in unstable 25-meter-deep pits that could collapse at any moment. They mine gold underwater, along the shore, or in rivers, with oxygen tubes in their mouths. They also process gold with mercury, a toxic metal, risking irreversible health damage from mercury poisoning." Along with many other reports and articles, this has had the effect of spurring retailers and industry bodies to move toward sustainable gold. Indeed, the World Jewellery Confederation insists that it does all it can to "Deliver a Sustainable and Responsible Jewellery Industry." Likewise, the use of so-called Fairtrade gold is growing; with businesses moving over to, or at least offering, this option at both retail and wholesale levels. ^ "Guld". Retrieved 11 September 2014. ^ Hauptmann, Andreas; Klein, Sabine (2009). "Bronze Age gold in Southern Georgia". ArcheoSciences. 33: 75–82. ^ "THE GOLDEN HERITAGE OF KARNATAKA". ernet.in. ^ ""How Much Gold Has Been Mined?"". www.gold.org. Retrieved 10 September 2018. ^ "Dan Oancea – Carlin: Where the Train Stops and the Gold Rush Begins" (PDF). Retrieved 5 May 2013. ^ "Gold Mining Map and Gold Production in 2017 - World Gold Council". www.gold.org. Retrieved 10 September 2018. ^ Calderon, Justin (27 May 2013). "World's largest gold mine reopens". Inside Investor. Retrieved 27 May 2013. ^ a b "Women die in Ghana mine collapse". BBC. 12 November 2009. Retrieved 12 November 2009. ^ Chemicals and Waste Branch UNEP: ASGM: Eliminating the worst practices, YouTube, September 2017. ^ Alvarez, N.L; T. M. Aide (2015). "Global demand for gold is another threat for tropical forests". Environmental Research Letters. 10 (1): 014006. doi:10.1088/1748-9326/10/1/014006. ^ Environmental and Health Effects. Cyanidecode.org. Retrieved on 26 October 2010. ^ "EARTHWORKS' No Dirty Gold". nodirtygold.earthworksaction.org. Archived from the original on 23 October 2016. Retrieved 17 October 2016. ^ ""What … if Something Went Wrong?"". Human Rights Watch. 29 September 2015. Retrieved 17 October 2016. ^ "MSHA - Noise Regulations - Compliance Guide to MSHA's Occupational Noise Exposure Standard - Main Document". arlweb.msha.gov. Retrieved 13 August 2018. ^ a b "Assessment of Equipment Operator's Noise Exposure in Western Underground Gold and Silver Mines". www.cdc.gov. Retrieved 13 August 2018. Wikimedia Commons has media related to Gold mining. 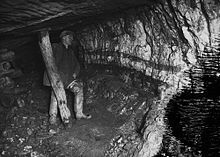 Look up gold mine in Wiktionary, the free dictionary.